A thought has been occurring to me a lot lately. It has to do with all upcoming games, especially the highly anticipated ones, and inevitably it always seems to hit me whenever there’s a big brouhaha about Star Wars: The Old Republic. I guess it really kinda amazed me how one tiny quote had everyone and their uncle scrambling to try and define what “Spring 2011” meant. Or when the prospects of PvP in the game were in doubt, fans scoured the internet for videos or articles for anything the devs said about the subject trying to argue it as proof of yes or no. Even I’ve found myself over-analyzing some of the things that have been said, like trying to dissect the “dozens of planets” quote six ways to Sunday. It’s what we do for the things we’re passionate about. Hence I hold no grudge against eager gamers for their conviction in digging up and trying to extract as much information from interviews or even seemingly offhanded comments, and oftentimes I even sympathize, especially when news is so sparse. But I still can’t help but wonder if this has made devs become more guarded and diplomatic in their answers (er, that is, even more so) now for fear that anything — even a candid statement — can be misconstrued and cause a shitstorm on the internet. Like, do they ever suddenly sit up awake in the night, face palming themselves remembering an interview earlier in the day, thinking, “@#%$, I really shouldn’t have said that”? Here’s generally my rule regarding rumors and hearsay when it comes to high profile games — take everything with a grain of salt. Unless it is information that has come through official channels or has been talked about or confirmed by a dev or the company, I don’t usually write about it until more has been substantiated. That said, there has been rumors over the last few days about the state of space combat in Star Wars: The Old Republic, and it all started from a write-up about an upcoming article on PC Action, a German magazine (Google translation of it can be found here). Back in June, Hunter and I made a friendly bet with each other about whether or not there will be space combat in SWTOR. A few weeks ago, it appeared victory was mine! But little did I know that our simple little wager would become so much more complicated. The crux of the issue, of course, is defining what space combat actually is. And for the most part, I agree with him — there has to be a line drawn somewhere. For example, I think we would both agree that a turret based shooter, space combat is not. That’s why I was a bit concerned when I heard the first murmurings of “on rails”‘ and “tunnel shooter”, because I started wondering what this might mean for our bet. Hey, on the bright side, at least I’m not QQing about the actual game! I’ve got 10 credits and my pride riding on this, people! UPDATE : To clarify, Space Combat is not a Turret Shooter (this is probably obvious after seeing the screenshot but some people were mentioning it in the other thread). That’s great news for both of us. And my own prediction for space combat remains the same — most likely scripted and instanced, possibly including cinematics, at these designated “hot spots” that players can travel to in order to initiate the action. The information in the PC Action write-up hasn’t really refuted that. To be honest, I think most people expected a polished and worthwhile space experience, but nothing overly elaborate. After all, SWTOR is first and foremost an MMO, not a flight simulator. The main game is driven by the individual class stories; space combat is and has always been a “side game” in my mind, perhaps even optional. Predefined paths, limited weapons, or repeatable quests be damned, I think as long as the gameplay doesn’t feel trivial, or that it’s thrown in as an afterthought, I would consider it space combat. The problem is that it’s just so subjective. Realistically, Hunter and I might not even be able to settle our bet until the game launches and we get to try out the space content for ourselves. But I think that’s okay though. The most important thing is, I consider Hunter a good blog friend, and what has come out of our friendly wager is an opportunity for me to discuss news about SWTOR with someone else who seems just as passionate about the game as I am. That’s always a good thing in my mind, because God knows the blogosphere is the only place I can find others with whom to share my enthusiasm and love for SWTOR. No doubt we’ll both be keeping our eyes out for more information on this subject. I for one am not giving up convincing him that I’m owed my 10 credits! Anyway, now that that’s out of the way, let’s take some time to think about the PC Action write-up. 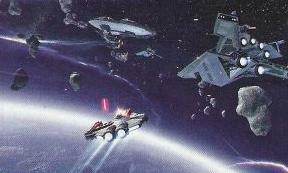 Even if it all turns out to be true, is space combat being on rails and pushed along from behind really that bad? Jaramukhti, a commenter on this blog, has likened this style of gameplay to Star Fox, which like he pointed out was an awesome game with some pretty fun flight mechanics. Like I said, and like what Hunter has already alluded to, if you were looking for game with a huge emphasis on space combat and free flight, an MMO probably isn’t what you should have been looking for in the first place. Bioware has never claimed SWTOR would be a game centered around space combat, so why demand it to be? On the contrary, what they’ve always emphasized is story and we should expect all development to be built upon that. Personally, I’m happy enough with the fact that space content is even included. Hence I’m neither excited nor disappointed about the article. It’s truly perplexing to see words like “ruined” and “deal-breaker” when it comes to the discussions I’ve seen pop up in the last couple of days about this topic. Everyone is entitled to their opinion, but I can’t help but wonder how people can be so affected (read: freaked out) by the new information that’s come out about space combat, authentic or not. In my view, misgivings should be reserved for bigger things instead of wasting energy complaining about something that’s an “extra” and that has never been touted as a main feature. A few weeks ago, we didn’t even know for sure if there was going to be any content based in space, let alone space combat. If the game excited you before then, why should these new rumors change anything? …Or maybe it’s just the sensation of my heart sinking. Shacknews reported today that the CEO of EA John Riccitiello said in a conference call that a “major MMO” of theirs is “making great progress towards a Spring 2011 launch.” You can read the whole article here. 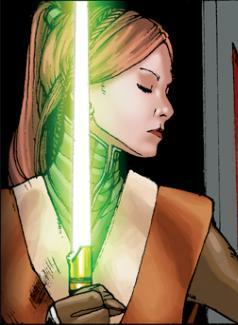 Could this game be Star Wars: The Old Republic? It’s certainly possible that EA has another MMO in the works, but I personally don’t think that’s a very likely scenario. This just goes hand in hand with my last post on SW:TOR that I made a few days ago, regarding my increasing doubts about this game being ready for a 2010 launch. A few months ago, I was convinced that this game would be coming out this year but now, especially with this new development, that’s changed. Already, the thread on the SW:TOR forums on this matter has grown to over a thousand posts, and some have pointed out that Riccitiello didn’t actually specify whether he was referring to the calendar 2011, or the company’s fiscal 2011. Keep in mind that EA’s fiscal year runs from April 2010 to March 2010, and you can see why this is relevant. Are people simply grasping at straws here? Who knows. I just know I’m not holding my breath. And as usual, Bioware is keeping mum. According to an update from IGN, there has been no confirmation on anything. Update: Bioware has come out and confirmed they are targeting for a spring 2011 release…as millions of voices suddenly cried out in terror, and were suddenly silenced. Sorry, I could not resist. So the internet has been abuzz with the rumors that the next Blizzard MMO…will be a Sci-Fi FPS? According to the French site NoFrag, an inside source has stated that the new game will take place in a futuristic universe and will feature two elements: a social life where players can interact with each other akin to The Sims Online, and a second life they can connect to which allows them to engage in combat, which is presumably where the FPS part comes in. Like, wow. I knew Blizzard has stated that their new MMO would be completely different from World of Warcraft, but damn. Providing this rumor has any merit, this is farther than I thought they would stray. For some strange reason, I keep thinking Avatar. Or maybe, True Lies. Also, I never thought I would ever see The Sims Online and FPS together in the same sentence, or nay, same paragraph, even. Oh well, there have been stranger bedfellows. It would be interesting to see how this plays out, as some of the most rabid MMO players (and WoW fans) I know hate FPS games with a passion. You are currently browsing the archives for the MMO Rumors category.